First, thanks to those who commented on yesterday's essay, and to The Handstand (in Ireland) and CounterPunch which both published it today, and to those who said they would be sending it around. When I woke up yesterday morning I had no idea I would write that essay, so a special thanks to Gordon Sturrock for the spark that resulted in its creation. "BG" pointed out a few typos, so this newsletter includes a slightly corrected version (see the P.S.). Two people wrote to say they don't believe Iran is heading towards testing a nuclear weapon. But Iran hardly needs nuclear-derived electricity! They have oil, wind, solar, geothermal, wave -- they have lots of cheaper, safer, energy. Some say they need nuclear power because they have oil, but no refineries. But then, wouldn't building a refinery make more sense, at far less cost and risk? On the other hand, Iran undoubtedly feels threatened (rightly or wrongly) by the United States, and Iran probably believes (rightly or wrongly) that possession of a nuclear weapon would reduce the chances that the United States would attack them. Iran has already demonstrated simultaneous launches of long-range missiles, which suggests that if / when they do test a nuclear weapon, they'll probably test more than one simultaneously (which will also make it very difficult to determine the yields very precisely). If the world really doesn't want Iran to test a nuclear weapon, probably all it has to do is convince Iran that no one will attack it with one. Good luck on that. The other choice is to let Iran admit they have one (or more) nuclear weapons without demanding that they test them for the world, to "prove" their existence. We could just simply agree to believe Iran really has such weapons (as is done with Israel). Or Iran could provide us with tangible proof which our scientists would accept. Wouldn't that be a novel way to prevent another "test" of these eco-maiming weapons of mass destruction? Even underground tests produce radioactive fission waste products, which are invariably vented to the atmosphere, and contaminate ground water, soil, etc.. Still, if Iran tested a nuclear weapon just to prove they had one, life would probably go on without significant obvious changes -- except to those babies and other living things who would be poisoned by the fallout. This writer believes the evidence suggests that Iran is going to "test" a nuclear weapon some day. But who can say what day Iran's leaders might think is a good day for such a test? We would all be better off if we could convince Iran not to test a nuclear weapon even if they have or build one. P.S. : "had" for "has"; "soldiers'" for "soldier's"; "whoever" for "whomever"; "ask" for "as"; and the sentence about nature's billions of cancer deaths was rewritten. World War Two certainly did not end with a whimper, but with a bang. Two very large bangs -- three if you count the Trinity test blast (and you should). The war drums have continued banging ever since. What could have been one of the more joyous dates in history -- the anniversary of the end of the last Great War, World War Two -- is, instead, a time of deep reflection about how it ended, and what it started. Each year, old questions are asked anew. Were the bombings of both Hiroshima and Nagasaki militarily necessary? Was the suffering endured by innocent Japanese, including tens of thousands of children, "worth it," as the nuke-bomb proponents always assert? Should America feel more guilty now, with all we've learned about the delayed effects of radiation poisoning? To try to answer these questions, let's look at the facts. Fact: The bombings could not possibly have been tactically necessary. This is inarguable, since both Hiroshima and Nagasaki, and several other cities, had specifically not been bombed so they would be available for the "device." They had to be set aside months earlier, because "clean" targets were getting hard to find. We already had nearly complete control of the air. Aside from our own curiosity, it was hoped that the use of hitherto-undamaged cities would make it clear to Japanese military brass what The Bomb could do. Fact: Japan was seeking to surrender (through Russian diplomatic channels) at the time. We knew the Japanese wanted to surrender because we had deciphered their codes. We were waiting for the Russians to tell us about the Japanese offer. The Russians had their own reasons not to tell us, and we had our reasons not to want anyone to know we could read the Japanese codes. And few people had any idea how momentous what was about to happen really was going to be. Fact: Top Americans knew there would be just two bombs (plus the test in New Mexico, already accomplished the month before) -- if they both went off successfully. Nobody else anywhere else on earth knew this. If there was any vital strategic military advantage, that was it. The threat of yet more atomic bombs was hollow, at least for the immediate future (weeks, at least, and probably months). But, practically nobody knew it. Americans had fought for tiny islands, one soldier, one marine, one sailor at a time. Were we right to declare, apparently for all time, that no matter how many innocent civilians must die as a consequence, using The Bomb was justified if it saved American lives? Was THAT the real declaration made at Hiroshima and Nagasaki, and backed up today by the Bush Administration? Could we have skipped the Trinity test and used that bomb against Japan in July? There were many reasons that wasn't likely. Most scientists felt that a test was absolutely necessary to ensure the bomb would work. They wondered about the complexity, the uncertainty, the delay in transporting the bomb. And some scientists wondered: How could it possibly be "humane" if they didn't know what the yield would be, by at least an order of magnitude? But what if Japanese and other foreign representatives had been invited to witness the test, and it had been held with lots of old military vehicles at various distances from the "zero point" as it was then called (before the term "ground zero" came into common use)? Inviting Japanese observers was briefly considered, but rejected. Should it have been? At Alamogordo, New Mexico, on July 16th, 1945, perhaps the best opportunity to save about a quarter of a million Japanese lives, and perhaps to stop the war then, and thus save thousands of American lives as well, was missed. Today, citizens of Alamogordo don't celebrate "Trinity." Each year, the local Chamber of Commerce organizes only two trips to the bomb site for visitors -- the first Saturdays in April and October. Time has yet to tell if any strategic advantage was achieved in the long run by the Hiroshima and Nagasaki bombings, but it looks unlikely. The distinction of being the only country which has used The Bomb, a poison gas weapon, against mostly-civilian populations has not been a mark of pride for conscientious citizens of the United States, who, one hopes, are the majority. Nor have the subsequent bomb tests ever been well-accepted by the public, especially as the dangers became more scientifically established, even as an ongoing propaganda campaign attempts to diminish the public's knowledge of the facts. Bombing Hiroshima and Nagasaki started a nuclear weapons and arms-testing phase which poisoned the planet for generations to come, cost several countries over a trillion dollars each, and is the root cause of millions, if not tens of millions, of cancers. The fact that nature kills billions through cancer does not give us permission to kill millions more. Yet that is the kind of thinking pro-nukers use! Pro-nukers will dismiss the danger of tritium, for example, and play the "expert" card, telling you, reassuringly, that tritium's decay particle is "a very low energy beta release." And you can look up the energy, and compare it to some other beta releases, and find that they are right. But the pronukers won't ever mention, and many won't even know, the truth about tritium: For example, that the "OH" free radical it usually leaves behind after one atom of a water molecule transforms into helium is extremely hazardous. Or the fact that a beta particle's damage is nearly all done at the end of its track, so one that starts out "slow" (which is still a good fraction of the speed of light) does about as much damage as one that starts out "fast." Pro-nukers never mention these facts about tritium. They don't mention that it absorbs through both the skin and the placenta -- you can't protect your fetus from it. Nor do they mention all the places hydrogen, if it's not on a water molecule in your body, might be used -- the places where tritium masquerades as hydrogen until the moment of decay. American WWII veterans are now in their 80s and are dying fast. Some of them absorbed enormous amounts of radiation when they went into Hiroshima and Nagasaki soon after the bombings, while those places were still very "hot." Our own surviving soldiers are suffering, as are so many other "downwinders." Our "allies" who have also set off hundreds of "test" nuclear explosions, now also face class-action lawsuits by their own citizen-soldiers who were poisoned by their "tests." Has justice been done? Imagine that instead of Hiroshima and Nagasaki, we had bombed strictly-military targets with our two bombs. Would that have made it okay? Of course not, if only because the radioactive fallout would still have spread all over the globe. What if we had bombed larger cities? That would only have made the moral failure worse. By the time the decision was made to protect some cities for the coming "demonstration," the most suitable cities had all been bombed, often many times. In order to reduce America's subsequent feelings of guilt, some scientists wanted to drop leaflets warning the target cities about radiation's dangers -- to explain the scientific and medical effects of the "poison gas" attack which was coming. Leaflets were not dropped, but copies of a letter written by three scientists working at the bomb assembly site on Tinian Island and addressed to a Japanese scientist WERE dropped, apparently surreptitiously. The letter warned of more atomic bombs to come, and implored the scientist to tell his leaders about the many unique characteristics of The Bomb. A copy of the letter found its way to the Japanese military command. To those who argue that the use of atomic bombs saved American lives, one must ask: If the bombs had not been used, would the nuclear arms race have ensued, spreading billions of Curies of deadly fission products throughout the globe? Not a breath is taken -- not a baby's first breath, nor a Pope's last -- that doesn't include some radioactive isotopes of this "non-conflict." The arms race destroyed hundreds of idyllic but then-remote locations (this was before jet travel became popular, and made the whole world seem smaller). Would everyone have refrained from poisoning the planet with so many radionuclides -- poisoning that is excused by speciously, facetiously, falsely, and maliciously claiming that perhaps a little radiation is "good for you" or even, as General Leslie Groves, head of the "Manhattan Project" (which built The Bomb), put it in Congressional testimony shortly after the war, that radiation death was, he thought, a "pleasant" way to go (it isn't)? Lies have always accompanied The Bomb. It was born of such secrecy that probably at most only a few hundred of the 130,000 people who worked on it during WWII even suspected the real nature of their work. But after Hiroshima, most of the secrecy was pointless. Top nuclear physicists knew that "how" wasn't really that big a secret, once it was proven that it COULD be done -- and there was ample proof of that. Creating a nuclear bomb was no longer impossible for any nation. Any competent scientist could do the calculations, and figure the minimum size needed to assure success with the degree of certainty desired. It was difficult, dirty, and expensive, but not impossible. That's still true today. After The Bomb was used, nearly all the secrecy was, arguably, for political reasons: The costs were staggering and embarrassing, the environmental damage was equally staggering, and the risks were monumental, too. 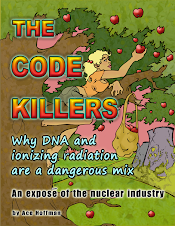 Technicians were being poisoned by stable beryllium (a rare element needed for bomb-making), and by radioactive plutonium-239, tritium (H-3), strontium-90, cesium-137, and hundreds of other isotopes. Secrecy aided the nuclear industry. They liked it. They still enjoy enormous amounts of secrecy, and they still like it. But even if one assumes (despite so much evidence to the contrary) that The Bomb had to be used against Japanese cities to effectively end World War Two, one still is left with the lies about how many people actually died, and the level of damage that was done to the DNA of the survivors, and whether ANY of the thousands of nuclear weapons tests which followed were necessary. And one has to wonder if the last chapter has yet to be written? Will America be attacked some day with a nuclear weapon? If it happens, will we know where it came from? Will we retaliate with a nuclear strike against whatever country we believe attacked us, even if we are wrong, and even if only a small number of military crazies -- not all the innocent civilians under their yoke -- actually thought of, planned, and carried out the attack, much like a terrorist cell? Will our military leaders retaliate with 100 megatons for every kiloton used against us? Would they do so even if such a retaliation would be abhorrent to most of us? The Hiroshima and Nagasaki bombs are considered puny (the technical term is "nominal") these days, and have been for 50 years. Are we ready to do this all over again, only worse? That is the real question that has yet to be answered. The U.S. conducted over a thousand nuclear tests on U.S. mainland soil, and over a hundred tests elsewhere. These tests show a stunning lack of concern for the environmental consequences of nuclear warfare -- the cost to civilians. Each post-war test blast produced only a "nominal" amount of militarily-useful information (such as, how did this year's model of tank fare, compared to last year's model, and does this trigger work better than the last trigger?). Nuclear warfare seems more inevitable than ever this year, as Iran proceeds towards becoming a "nuclear state," following North Korea a few years ago. Iran will probably greet the new American president, whoever he may be, with a nuclear test. Nuclear power plants are military targets and, like atomic bombs, are poison-gas producers as well. Yet the Washington policy-makers have recently added billions of dollars for new nuclear reactor-powered troop-carrying amphibious assault ships, aircraft carriers, and submarines, and billions more for stationary targets, known as commercial nuclear power plants (which are targets not only because of the panic and suffering their destruction would cause, but because they create the plutonium, tritium, etc. used in atomic bombs). When some of these reactors melt down, perhaps from Genpatsu-Shinsai (a Japanese phrase for an earthquake leading to a meltdown), or perhaps in some harbor somewhere due to a hostile military action or a terrorist attack, it will create an international "incident" requiring more lies about how safe radiation is, and how diluted it will become. But in reality, the verdict is in: Radiation destroys democracy, lives, land, air, water, budgets, and our DNA gene pool. Is there ANY military advantage which could be worth all that? The author is an educational software developer and bladder cancer survivor, as well as a collector of military and nuclear historical documents and books. He is the author and programmer of the award-winning Animated Periodic Table of the Elements. He has spoken at over one hundred public hearings on nuclear issues, as well as to over 100 computer clubs. His previous essays on these subjects have been read by millions of people. He is, of course, pointedly ignored by all his elected government officials, so he suggests you send the above essay to your own elected officials and ask them to read it. Nuclear Bomb Effects Computer: How big a bang do you need (with cultural landmarks, population densities, and other relevant data for the 120 largest metropolises on the planet)?